Difficulty sleeping can be an incredibly frustrating problem, because it feels as though there is nothing you can do to fix it except lie in bed and wait. However, although it may seem hard, it is possible to learn how to sleep better. 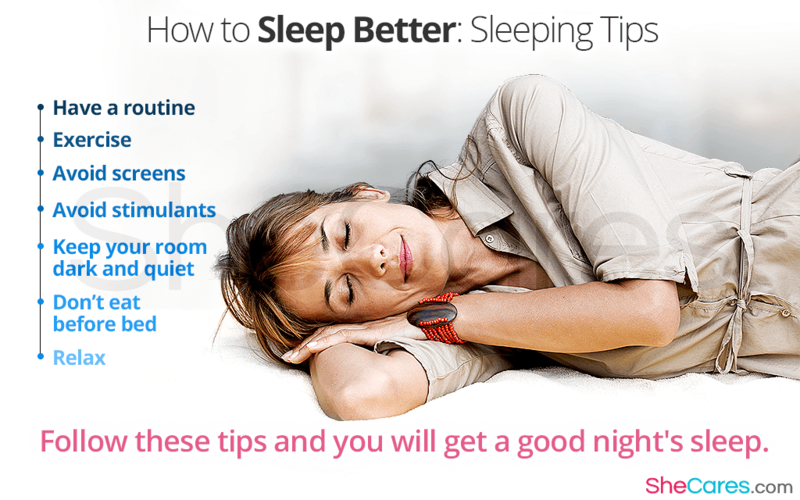 Follow these tips for better sleep, and in no time, you will get a good night's sleep. Going to bed and waking up at the same time each day is one crucial way to improve your sleep. It lets your body know when to expect bedtime, so it can begin to prepare the right hormones and chemicals for sleep. Although sleeping in on the weekends is tempting, you should try to resist. Don't exercise right before bed, but getting a workout in earlier in the day can help you sleep better. Exercise tires your body out, which makes it more likely that you'll be ready for sleep at night instead of tossing and turning, wide awake. Additionally, exercise releases relaxing neurotransmitters in your brain that can help you sleep even hours later. It's common knowledge that screens emit a blue light that makes you less likely to be able to fall asleep quickly, but people still tend to use phones and computers right up until bedtime. The blue light from electronic devices represses the production of the sleep hormone melatonin, making it more difficult to sleep. Try choosing an activity without screens in the hour before bed. Most people know not to drink caffeine right before bed, but caffeine can actually last in the human body for up to eight hours, so even a mid-afternoon coffee might be having a detrimental effect on your sleep. Many people also don't realize that the nicotine in cigarettes is a stimulant that can keep you from falling asleep. Sleeping is much easier in a room without distractions or anything to keep your mind busy and alert. Darkness is the best environment for sleep, and sometimes, that means even covering up a bright clock to eliminate the glow from its face. While some music can help people fall asleep, be sure to choose calming tunes rather than anything stimulating. Although a big meal can make you feel tired, eating right before bed - especially a lot of food - can actually make it harder for you to get a restful night's sleep. Try to finish eating two to three hours before bedtime, and if you need something right before bed, keep it small and healthy. If you go immediately from busy activity to lying in bed trying to sleep, it's likely to take a long time to turn your brain off and fall asleep. Doing something soothing and relaxing before bed can help your brain and body wind down and begin to get ready for sleep. You can read a book, take a warm bath, drink some herbal tea, or find another activity that suits you. With these tips for better sleep, you should be relaxing and snoring all night long in no time at all. If your sleep problem persists, it may be time to talk to a doctor. To learn more about managing sleep problems, read about herbal remedies to overcome sleep disorders.